Queen Elizabeth I (1533-1603) - Though England's monarchy has been dominated by kings (as is the case with most countries), arguably its greatest monarch ever was a queen. So successful was the reign of Elizabeth I, that it has been dubbed the "Elizabethan Era", which is synonymous with golden age. In fact, the only other period which rivals the Elizabethan Era is named for another queen; the "Victorian Era". Apart from the notable accomplishments achieved by the country during her tenure, it also marked the greatest stability of the English monarchy since the reign of Edward III. The years between saw a protracted war with France (The Hundred Years' War), a civil war (Wars of the Roses), the fickle reign of Henry VIII and the short tumultuous reigns of Elizabeth's half-siblings, Edward VI and Mary. The English people welcomed her as their queen as well; a sharp contrast from Mary, whom they viewed as "too Spanish" (on account of her being the daughter of Catherine of Aragon and wife of Philip II). Mary had tried to prevent Elizabeth from ever becoming queen by accusing her of inciting a riot to prevent her marriage to Philip II. She had hoped to execute her, but lack of evidence prevented it. Instead, she kept her imprisoned in the Tower of London for a year. But Mary's inability to have children and her death in 1558 insured Elizabeth's accession. One of her first acts as queen was the Religious Settlement, which abandoned Roman Catholicism and restored the Protestant Church in England. As a new queen, Elizabeth showed exceptional wisdom by leaning heavily on her advisers. Her closest for most of her reign was William Cecil of Burghley. Another important matter dealt with her marital status. She was still single when she became queen at the age of 25, which was quite old to be unmarried at the time. Although she entertained the prospect of several suitors, she ultimately never married. As a result, she is remembered as "The Virgin Queen". As the last surviving child of Henry VIII, this insured she would be the last monarch of the Tudor dynasty. The low point of her reign would have to be in 1587 with the execution of her first cousin once removed, Mary, Queen of Scots. Elizabeth saw her as a potential rival and, after an attempted assassination plot, had her tried for treason. 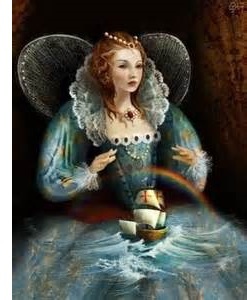 But she had little time to reflect on the act as the greatest threat to her rule and her country came the following year with the invasion of the Spanish Armada. Despite King Philip's claim that his fleet was "invincible", it turned into a smashing victory for England. From that point the British fleet replaced the Spanish as the most powerful in the world. Spain's navy was vital to maintaining its vast empire, and Elizabeth broke the power of that empire. At the same time, she set her own nation on the course to empire; one which would become one of the greatest in history. In addition to this, her reign was also marked by cultural achievements. English drama became the most prominent in Europe with writers like Christopher Marlowe and especially William Shakespeare.